Fee: $22/$18 members - includes an autographed copy of Lydia's Party, refreshments by MKELocalicious and admission to the sculpture garden -- come early for a stroll around the grounds! Register online now. You may also be interested in Women's Speaker Series: Cristina Henríquez, author of The Book of Unknown Americans, April 8 at Lynden. Lynden Sculpture Garden's Women's Speaker Series, Bronze Optical, and Boswell Books welcome Margaret Hawkins, author of Lydia's Party, to the Lynden Sculpture Garden, Wednesday, January 28, 7-9 pm. Lydia is having a party. It’s the party that she hosts every year for a group of six women friends who have come to value the annual midwinter fête as a cherished ritual in their lives. 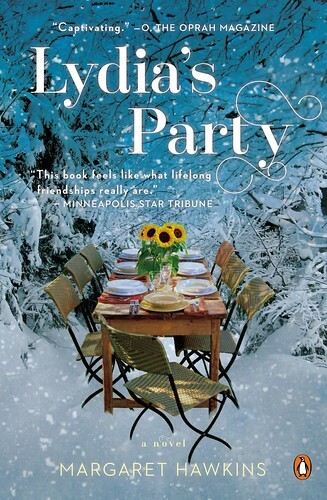 Over a table laden with Lydia’s famous spicy chicken stew, a sumptuous spread of potluck dishes, at least one case of wine, and a decadent number of desserts, the women revel in sharing newsy updates, simmering secrets, and raucous laughter. Twenty years ago, these friends bonded over their budding careers, their love of art and food, their romances, their dogs, and now they think they know all there is to know about one another. On this particular evening, however, Lydia prepares to make a shattering announcement. As we follow these women through their party preparations, we meet an unforgettable cast of characters, each of whom is navigating their everyday chores while also meditating in stolen moments on their greatest regrets, their complicated relationships, and their deepest desires. Having reached middle-age, all are pondering the states of their lives, wondering “what’s next?” now that the thought of a new romance or a new job no longer seems life-altering. But when Lydia delivers her news, she shocks them all, and they rediscover the enduring bonds of friendship and find their lives changing again in new and unexpected ways. This exquisitely written novel delivers a funny and tender portrait of friendship, love, aging, romance, grief, and unexpected happiness. It is a story that will warm your heart—even in the middle of winter. Margaret Hawkins is a Senior Lecturer at the School of the Art Institute of Chicago. She is the author of two previous novels, A Year of Cats and Dogs and How to Survive a Natural Disaster, and a memoir about her sister, After Schizophrenia: The Story of My Sister’s Reawakening.